I often sit back and wonder if I am actually making a difference with BE WISE. I wonder if it's really worth all the time and effort I spend working on it. And then, I have days like today. Days where I know without a doubt that it has been worth it. I received a message on Facebook from a girl whom I have never met. In the message she told me about how she just recently finished reading the last issue of BE WISE Magazine. She went on to say, "I feel that your positivity towards everything inspires me to be more than what I am... I look forward to reading those articles for an extra kick start/boost in my day." What this girl didn't know was that for the past couple of months I have actually been contemplating whether or not I want to continue blogging and creating BE WISE Magazine. As much as I love it, I never realized just how much time and effort it would require. After nearly three years of working on BE WISE I still go back and forth concerning exactly what I want it to be. I may not know what the future holds, but after drafting this post in my mind for over a month now, I feel I know what I want for BE WISE, at least for right now. For a time I balanced BE WISE The Blog and BE WISE Magazine with work along with being a full time student. When I graduated from the University of Utah over a year ago I was convinced I would have the time to commit to making BE WISE a success. What I didn't take into consideration was how much time and energy my new job would require. However, somehow I managed to make it work. Just over a week ago, however, some things changed... I landed my dream job. I was promoted at the high school I currently work at. I now have a big kid office (in the main office I might add) and real responsibilities. These new changes will be requiring quite a bit more of my time. So, what does this mean for BE WISE? That, my friends, is where I am not exactly sure. Up until today, I was determined that I would have to take a break from all of it for awhile. That would mean no more blogging and no more magazine. I was feeling rather content with my decision convinced that no one would really notice the absence of BE WISE anyway. Then, I got that message. The message that reminded me of all the other thoughtful and supportive messages I have received from countless people. I may not have the biggest following. In fact, I know that I don't. And you know what? That is okay. I didn't start BE WISE with the intentions to become famous or make money or get tons of free product. I started BE WISE to make a difference. If all I ever did was make a difference for that one sweet girl who decided to let me know through Facebook that my magazine had inspired her, then I have been a success. And a great success at that. That one kind thought from a perfect stranger has given me the motivation and even the courage to continue on with my passion and creating BE WISE. She had no idea when she sent it that it would have such a huge impact on me. I may still have to change a few things in order to make time for all that I will have going on in my life, but one thing is for sure, I will not quit BE WISE. Go out and spread kindness. You have no idea the positive impact you are capable of having in someone else's life. Let someone know how much they mean to you. Give someone a compliment.Send a kind text or email or message or letter. The possibilities are endless. 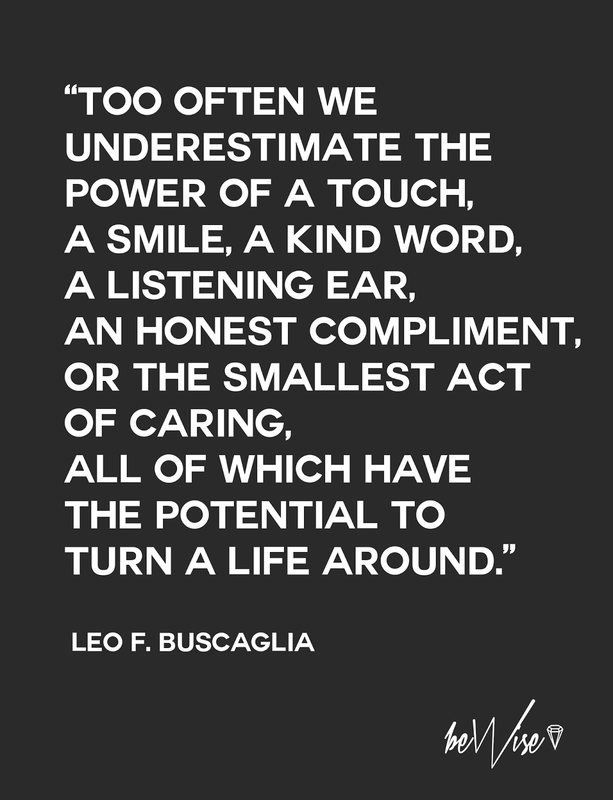 When has an act of kindness changed your life?